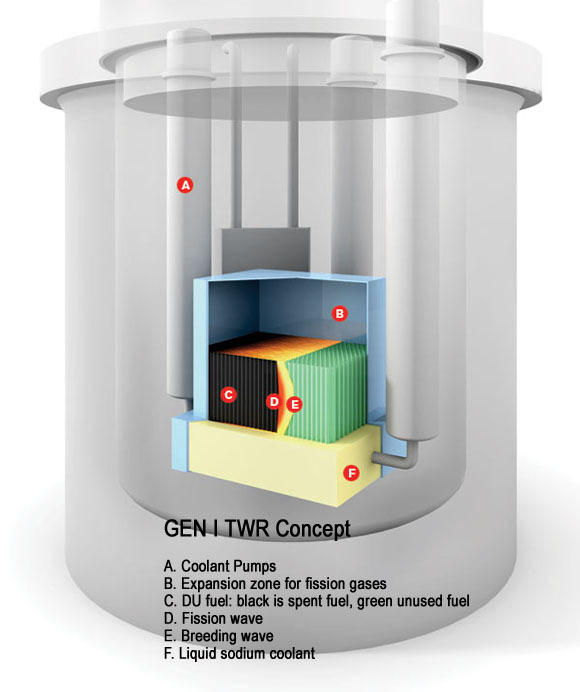 Conventional nuclear reactors use Uranium 235 as their power source. However, out of all the Uranium that we dig up, only about 1% is U-235 while the rest is composed of, its not so reactive cousin, U-238. So what can we do with this U-238? Well according to some new research, we can now use U-238 as a fuel to power a new generation of nuclear reactors. Bill Gates has funded a new startup called Terrapower which is attempting to build the first prototype of a new type of nuclear reactor called a traveling wave reactor. this reactor will be using uranium 238 as a fuel source. How this will work is that a bunch of uranium 238 rods will be placed around a rod of uranium 235. This rod of U235 will kickstart the entire process. The uranium 238 gets converted into plutonium 239. This will generate heat and keep the entire reaction going, and as it propagates outwards from the center in a kind of wave, more rods of U-238 can be added to keep it going. Once the fuel gets used up, it can be used to kickstart a new reaction. What this basically means is that you can burn the expensive fuel, you can burn the cheap fuel, you can burn the waste from other nuclear reactors and generate electricity from the whole thing. If we start extracting Uranium from sea water, which is apparently easy to do, we can provide enough electricity to power the entire human race without any problems for thousands of years.